The design is intended to completely separate the mid and treble cabinet from the bass. 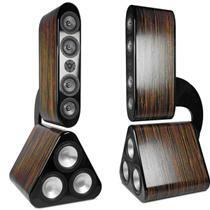 The 8T speaker from Status Acoustics looks like – well we're not entirely sure. It's definitely interesting though. The speaker features three 10-inch subwoofers in a triangular formation with four 6.5-inch midrange drivers and a single 1-inch tweeter all aligned vertically. Thing is, those two sections are separate. The unique design of the 8T was created to eliminate cabinet resonance. The top section is held in place by a wire-concealing bracket which adds even more to the strange look of the speakers. They'll be available in the spring at $50,000 a pair and in 30 different wood-grain veneers.